Mac OS X market share is growing nicely around the world with some pretty impressive numbers in North America, Oceania, and parts of Europe. As a continent, North America takes the cake at 14.09%, which isn’t too surprising considering it is the home of Apple. Next up is Oceania (Australia & New Zealand) at 13.71%. Europe as a whole is at a somewhat low 6%, but looking at specific countries gives a very different picture; Switzerland tops off everywhere in the world with a 17.61% Mac market share, followed by Luxembourg with 15.79%, Iceland at 15.18%, Norway with 12.14%, and Denmark’s 11.71%. The entire Asian market share is a low 1.61%, but when you consider the continents tremendous population size that might not be as low in real numbers as it sounds. 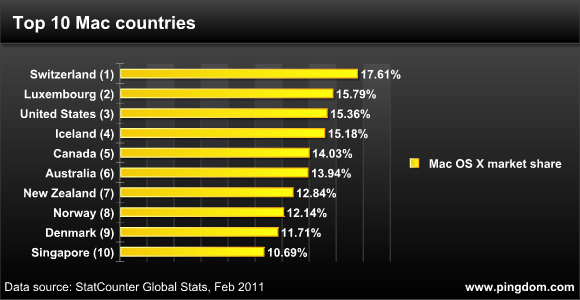 Evidence of that is in countries like Singapore, where the Mac market share is 10.69%. Rounding out the list is Africa at 1.47% and South America at 1.08%, which are both a bit lower than I would expect. This data was gathered by Pingdom (via 9to5Mac), who reminds us that “With the massive success of Apple products like the iPod, iPhone, and lately, the iPad, it’s sometimes easy to forget that Apple also sells personal computers.” This is certainly true, the Mac is often a side note when faced with the huge success of iOS hardware, but but there’s also a strong connection between Macs and iPhone, iPod, iPad sales. I know many people who have started off with an iPod, then bought an iPhone, and then bought a Mac, which is probably why Apple is growing in the PC world while their competitors shrink. I wish they broke this down more in EU, Asia, and South America. For instance, UK, France, and Germany have HUGE amounts of Mac users, most in the younger generations use them. In Japan, Hong Kong, and Beijing, Macs are extraordinarily popular, but countries like India and interior rural China bring down the average percentage where internet cafes are the defacto method of getting online due to cost prohibition. This is the same situation with South America, Rio and Buenos Aires have substantial numbers of Mac users, but again they are weighted down by the population overall. EU at 6% sounds low to me, perhaps they are counting Russia and Eastern Europe as well in that number and it is lowering the average by shear population size. Why? Breaking it down globally on a country-by-country basis is hardly the same as doing it on a state-by-state basis! The difference between countries within continents is far greater than between states in the same country. What you said about India isn’t totally true, especially as time passes. Here in Delhi, as well as in Bangalore, Chennai, Mumbai, and Hyderabad, there is a growing middle and upper middle class. I see Apple products everywhere (iPhone, iPad). And with certified apple retailers here in India, the market share of macs will increase dramatically. Although internet cafes are popular, high speed internet and broadband internet is huge here, especially in metro areas. Also with more men and women going into IT and computer based careers, there will most likely be more macs in the future. Macs in India???? My foot .. we hardly get 1Mbps of broadband bandwidth to the maximum even the ISPs providing it are total ****. How you’re ever gonna download huge software updates and stuff without a high speed broadband connection of at least 2Mbps??? This stat is rubbish. It only show data collected from websites that people with iOS or Mac OS has visited. Half the numbers would be more correct concerning actually owned Mac computers in my oppinion. 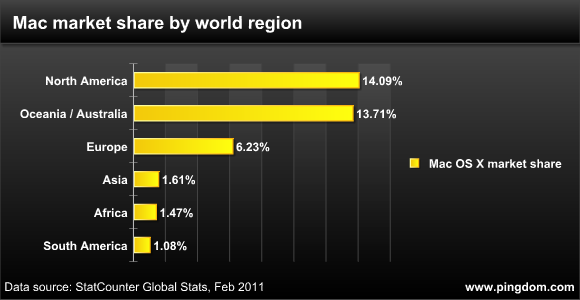 Mac market share in major cities worldwide are higher than these numbers reflect. I would be interested to see that data for NYC and SFC. @Jonas: Where did you gather that info? I’d add a few points on the stats, considering a fair amount of web visits with a Mac is done in Windows via Bootcamp or Parallels. Me and many of my friends are regularly gaming in Windows, and I tend to start and end these gaming sessions with a bit of surfing in Chrome for Windows. Might not count for tons of visits, but still a fair number. Africa beats South America? Incredible. – NO ebooks in iTunes, except a few free classics that you can get from Project Gutenberg anyway. – NO games section in ANY of the three app stores. If you are going to sell a device based on the ecosystem, then shouldn’t you ensure that the ecosystem is actually in place? Gotta go now. Have a ripped-from-dvd movie to watch on the AppleTV. If only i saw this report a year ago – i made a repport at the university about Apple market penetration. What I would like to see is the breakdown of personal/home use of computers. The high market share of PC’s is still skewed by the fact that they are overwhelmingly purchased by offices for workers. If you take out corporate sales and look only at personal sales, I would imagine the Mac share would be much, much higher. Interesting article. I am totally new to Apple products, and am trying to learn more about them. I work for a software company, and would like to know more about the languages of countries that use Mac products. From the data in this article, it seems that English based countries are dominant, do you think this is the case? Are there any other languages that are important? « Boost iPhone Reception with a Glass?